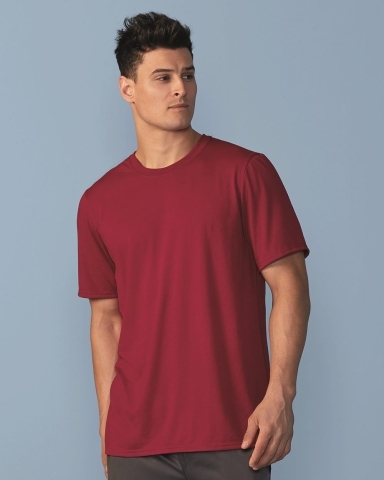 42000 Gildan Adult Core Performance T-Shirt This T-shirt works hard all day long thanks to AquaFX wicking technology and Freshcare antimicrobial treatment. Coordinate: Ladies 42000L, Youth 42000B 100% polyester jersey 4.5 oz AquaFXWhite can be used for sublimation. 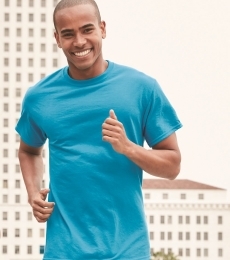 The Gildan 42000 is a Core Performance® Adult Short Sleeve T-Shirt made of 100% polyester, 30 singles. It features nice finishes with double-needle hem, sleeves and bottom and a flatlock stitched rib-knit collar. 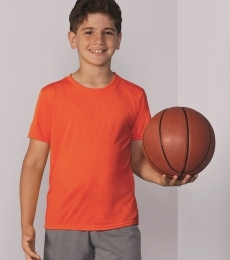 It also has easy-moving raglan sleeves and an easy tear label.